Female, bubble writing in biro on spiral bound A5 note paper. Cat owner, lives with partner. 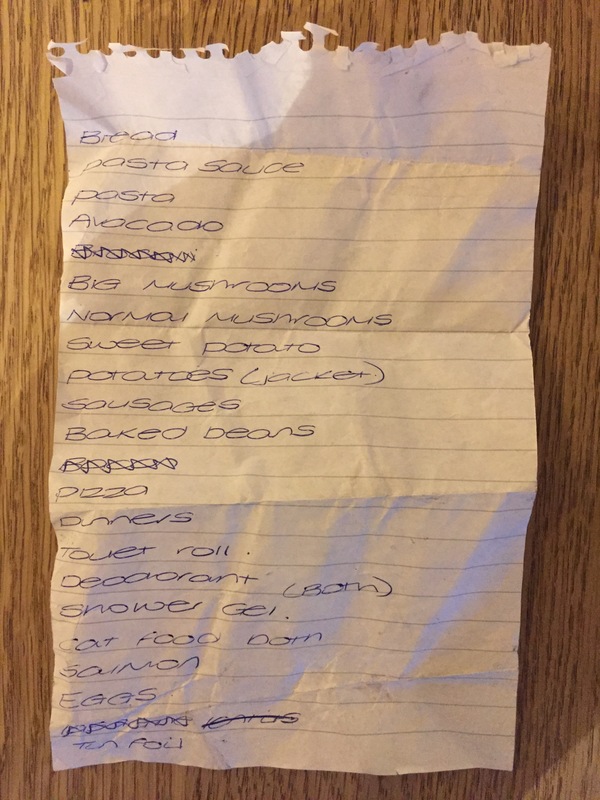 Bread, pasta sauce, pasta, avocado, big mushrooms, normal mushrooms, sweet potato, potatoes (jacket), sausages, baked beans, pizza, dinners, toilet roll, deodorant (both), shower gel, cat food born?, salmon, eggs, tin foil. Found in Aldi in Reading. Wonder what she’ll do with the big mushrooms. Portabella burgers, maybe? Now I have to find out what Portabella burgers are! They are burgers made with large, grilled portabella mushrooms instead of meat patties. Truly delicious.